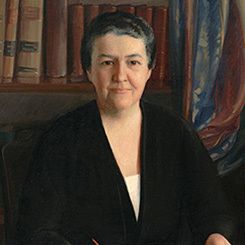 About this object Known as the “Mayor of D.C.” for her service on the District of Columbia Committee, Representative Mary Norton of New Jersey was the first woman to chair four House committees: District of Columbia; Labor; Memorials; and House Administration. On this day the House established the Committee on Education and Labor, with Representative Jehu Baker of Illinois serving as its first chairman. In 1883, the House split the committee into two separate panels—the Committee on Education and the Committee on Labor. The Legislative Reorganization Act of 1946 merged both entities again beginning in the 80th Congress (1947–1949). Since that time the committee has been named either Education and Labor or Education and the Workforce. During its distinguished history, the Education and Labor Committee has boasted many leaders from minority groups. Representative Mary Norton of New Jersey became the first woman to chair the Labor Committee in the 75th Congress (1937–1939), shepherding through the House the Fair Labor Standards Act of 1938, which provided for a 40-hour work week, outlawed child labor, and set a minimum wage of 25 cents per hour. Representative Adam Clayton Powell of New York became the committee’s first African-American chairman in the 87th Congress (1961–1963). Powell oversaw the passage of the Higher Education Act of 1965, which authorized $840 million dollars for enhanced teacher training and student programs in under-served segments of the education system. Later, Gus Hawkins of California chaired the committee from 1984 to 1991.